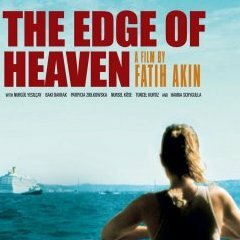 The Edge of Heaven, directed by Fatih Akin, is a carefully crafted, tender account of six interwoven lives. Ali is a effervescent Turkish expatriate living in Germany with his bookish son Nejat. The film begins with Ali inviting Yeter, a Turkish prostitute, to become his live-in girlfriend - much to Nejat's dismay. Yet Nejat quickly gains respect for the grim but kind hearted Yeter and after her sudden death, he returns to Turkey to search for her daughter Ayten. Ayten meanwhile, is a defiant political activist desperately refuge in Germany after an encounter with the Turkish police. Penniless and homeless, she is taken in by a German student named Lotte and her disapproving mother. When Ayten's asylum plea is rejected, Lotte follows Ayten to Istanbul to help secure her release from prison. Ayten's flight to Germany illustrates the extreme vulnerability that pervades the migrant experience. Ayten must rely completely on the mercy of strangers; though she is initially assisted by a network of expatriate Turks, Ayten is disgusted by the greed and churlishness shown her fellow country-men who appear to have fashioned a business out of illegal migration from Turkey. Moreover, Ayten's return to Turkey demonstrates the tinge of naivite - or perhaps ignorance - that underlies the forced repatriation of Turkish asylum seekers. Ayten is informed that given Turkey's quest for EU membership and its ensuing political reforms, she will not be unjustly treated in her homeland and thus has no grounds for political asylum. Yet, in its ensuing portrait of Turkish politics and bureaucracy, the film hints at the misplaced optimism that informs the treatment of political refugees from Turkey. A sense of incompleteness is omnipresent in the film. While some characters reach the ultimate state of perfection and peace - death - the rest of the characters linger on the "edge of heaven", without closure to their respective problems. Though the protagonists' lives are intimately intertwined, they never reach full harmony or synchronization as a series of near misses and missed chances prevent each from fully achieving their goals. It is this irresolution that lends the movie its uniqueness and its haunting quality. However, the film ultimately comforts its audience by showing how new relationships are forged between different characters, even where reconciliation seemed impossible. It speaks to the power of forgiveness and dialogue, a message ripe for director's native Turkey, whose deep-seeded fissures have surfaced yet again through the recent head scarf conflicts. Indeed, the chasm between the secularists and Islamists in Turkey seems is as unbridgeable as those that divide the conflicting characters in the movie. 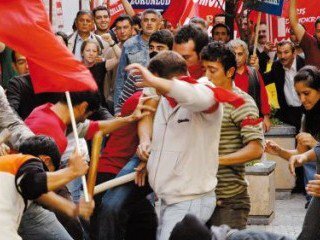 The film subtly alludes to Turkey's politically charged climate and to the significant disparities that exist between different factions of Turkish society. Though Turkey's democratic tradition and prosperity relative to its neighbours are impressive, a careful reading of the movie (and the current news ) illustrate that the country is still plagued by a host of political demons. The secular republicanism of modern Turkey's founding father Mustafa "Ataturk" Kemal has, for many, represented freedom and modernization. But others, such as the "head scarf women" that have dominated the news of late, complain that social mobility in Turkey depends on fitting a westernized, secular Kemalist mould - a mould that simply does not fit a large segment of Turkish society. Turkey is a nation struggling to reconcile its secular heritage with its Islamic one; it is struggling to find an articulation of national identity that reflects its ethnic diversity; it is struggling to remove the drastic inequalities in class and gender that pervade Turkish society. Like the characters in the movie Turkey itself teeters on the edge of heaven, its democratic project falling just short of realization, its ascension to the EU just slightly out of reach. Though the movie is undoubtedly humanistic rather than political in orientation, the salvation its protagonists find in dialogue and repentance is certainly applicable to modern day Turkey. The characters end by rejecting the elements of dogmatism and rigidity in their lives; and while this process does not bring an immediate resolution to the conflicts between them, it leaves the audience with a sense of hope and optimism. In light of the deeply entrenched acrimony between various segments of Turkish society, a similar path may prove to be Turkey's salvation, too.